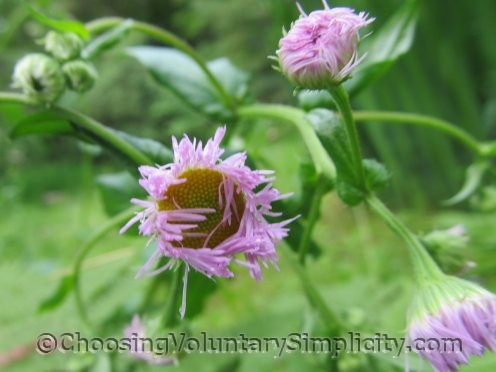 Home » Woodland & Meadow Perennials » Is It Common Fleabane… Eastern Daisy Fleabane… or Robin’s Plantain Fleabane? 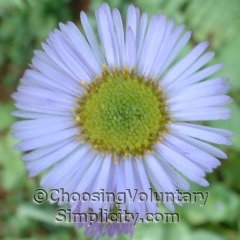 The native wildflower fleabane (the Latin name is Erigeron) is very common in this part of New England. 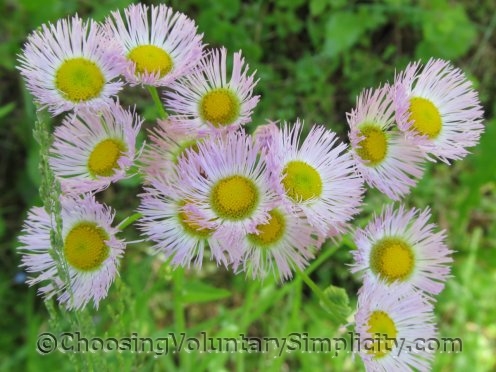 The name fleabane supposedly is a reference to the old (mistaken) belief that the plant repelled fleas and other insects when bunches of dried fleabane were hung in a room or burned. There seems to be more fleabane around this year than usual… perhaps because of all the rain? 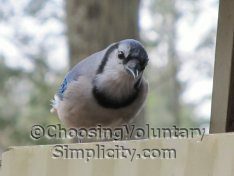 I have tried to identify the different types, but it is difficult because much of the available information is so conflicting. 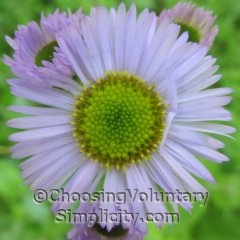 It doesn’t help that all the types I’m familiar with are often called just daisy fleabane! I THINK we have three distinctive types of fleabane growing here… common fleabane, Eastern daisy fleabane, and Robin’s plantain fleabane. 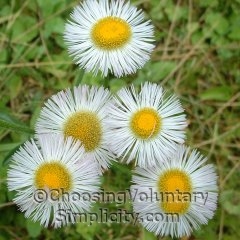 Common fleabane, sometimes called Philadelphia fleabane, has flowers that are 1/2 to 3/4 inches across. The flower petals (rays) are thread-like and can be white, but around here they are more often pink, purple, or even a pale shade of bluish pink. The pinkish purple flowers seem to grow in the more shady areas… perhaps color is also influenced by the type of soil? 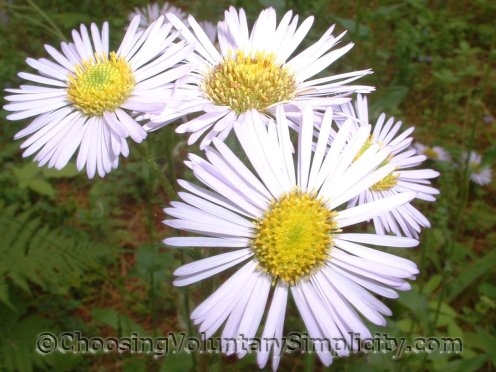 The Eastern daisy fleabane resembles a true daisy but with much narrower petals… and with two to four times as many of them. The flowers are usually white and only about half an inch across. Two identifying factors for this fleabane are that the individual petals are not thread-like and there is a lack of a leaf rosette around the lower part of the stem. 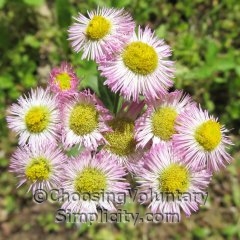 Robin’s plantain fleabane has flowers that look similar, but they’re larger (1 1/2 inches across). This type of fleabane has the basal rosette of leaves around the bottom of each stem. Flowers can be white to pink and lavender, and the petals are rods instead of thread-like. All of these fleabanes have alternate leaves with their largest leaves nearest to the bottom of the plant. 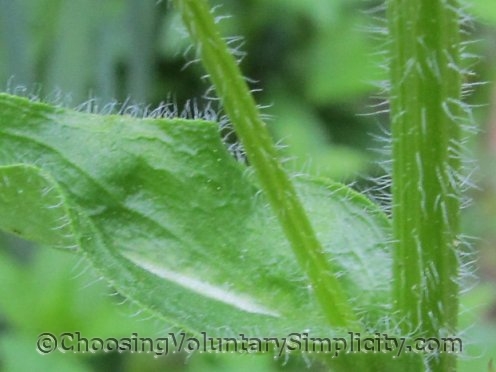 Their stems and leaves are covered with short white hairs. The plants can grow anywhere from one to three feet tall and they spread by reseeding. Flowers appear in late spring or early summer and close at night into feathery buds. Often the buds will stay closed in the early morning or on a very cloudy day. We have a good-sized group of the pinkish purple fleabane growing at the edge of our lawn, and we’ve been mowing around it. An amusing reference in a gardening article mentioned this very thing… that despite fleabane being technically a weed, it’s a very common sight to see otherwise well-manicured lawns with an unmowed patch of fleabane. So I guess we’re not the only ones sparing these flowers because they are just too pretty to mow down. We have the fleabane… it would be nice if we had the well-manicured lawn! We have some of these!!!! I didn’t know what they were though so thanks for this post. I like the little feathery petaled ones best. They are so delicate. Another informative and interesting post. I am blown away by all the great stuff here. I keep coming back and spending more time than I should reading your awesome blog. This is so weird. I was just talking with my neighbor and we were wondering what the pretty flowers on her lawn were and I come in and do my daily check of your blog and find this article about the flowers we were just talking about. Those are great pictures too. I went back out to see if the stems and leaves had the hairs and they did. This was very interesting too. I was just trying to identify the little flowers on my lawn and didn’t know it was fleabane. I just read your information and found it really helpful. Now I know I have the eastern daisy type. Great blog. I love wild flowers even if some call them weeds. We have a patch of mouse-eared hawkweed we mow around. It spreads like crazy and can take up the whole yard. OK by me. Less to mow and saves the environment. This year we have two beautiful yellow lady slippers come up, saved from a ditching job in North Dakota, bought on eBay. They didn’t do a thing for 2 years but they now have babies! Our pink lady slippers didn’t show this year but we have jack-in-the-pulpits aplenty!